While everyday in my office is casual, Fridays for me are all about comfort. I wore a look similar to this for date night a while back; I love the ability to make jeans & a t-shirt look dressed up & edgy or cool & casual based on my hairstyle & accessories. In addition to my usual beauty routine, today I am wearing not one, not two, but three great products that I recently received c/o Style Watch Style Hunters. The first is a sample of Burt's Bees dark spot corrector that I have been using in the morning, following my daily cleanser & moisturizer. I love Burt's Bees products because of their natural ingredients, so I was really excited to receive this one. The product just arrived last week, so I haven't seen a difference yet, but I'm willing to test any product that promises to brighten up my skin. Get a coupon to shop your own Burt's Bees brightening products here! 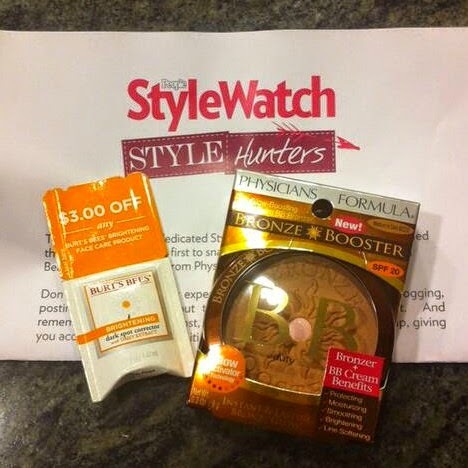 Style Watch must have known I was in the market for a new bronzer, because the second product I am wearing today is Physician's Formula Bronze Booster. I have used Physician's Formula in the past, so I already knew the benefits of their products. This bronzer is infused with ingredients that will smooth & moisturize your skin while giving you a gorgeous summer glow. Learn how to apply this bronzer for your best faux-glow! Lastly is the one I am most excited about. I received L'Oreal Extraordinaire Lipstick by Colour Riche, worn above, in the most perfect shade of Coral Encore. I was surprised to find that this lipstick is applied more like a gloss (with an applicator brush, rather than a swipe onto the lips), but it wasn't drippy or sticky at all! While I love the shiny color that glosses normally give, stickiness is one of the main reasons I stay away from them. This one was awesome! No stickiness plus long lasting color. I am hoping to buy this lipstick in it's additional shades: Blushing Harmony & Ruby Encore. What are some of your latest & greatest beauty products? I have always associated Birkenstocks with the hippie culture (showing my age now...), but those look great on you! Me too! But this leather pair is surprisingly wearable! I am loving the whole relaxed summer look. That bag is gorgeous and Birkenstocks totally scream summer. The bronzer looks quite nice. Great outfit. That bag is gorgeous!! I love the whole outfit! You look relaxed, but still put together! I also have that L'Oreal product! it's a great lip product! That lipgloss is my go to now--love the coral for Summer!! Me too! It's such a great color! I love that bag! And the shirt is just gorgeous. I LUV my Birkies! I have 6 or 7 pair and have had them for years! hmmm maybe time to get another pair! I absolutely LOVE Birkenstocks. Your entire outfit is super cute. The Birkenstocks look great on you! I wish I could pull them off. But with size 10 feet, they tend to just make my feet look big, whereas of course I try to wear footwear that make my feet look a bit smaller. Less like Bigfoot ;). You pull them off so well, though!!! Lucky you! I am a huge fan of Physcian's Formula bronzer. It works great and lasts forever! I have been checking out the Birkenstocks that are updated with cooler colors/textures and think I might take the plunge and buy a pair! Yes, I have my eye on a few other pairs right now! I chose black because they are so classic & match everything! Right now I'm in love with NYX and Tarte's butter lipsticks! They both have perfect shares for summer and last all day! Two of my favorite things! I'm obsessed with boyfriend jeans and have just recently gotten into birks. Cute outfit! I love this look on you. It is casual, yet flirty fun. You pull it off beautifully. I am loving the shoes. I don't know why that is the first thing I notice on someone. Thank you for sharing with us. That is a great and very comfortable looking outfit. I love the bag and Birkenstocks are so comfortable. I am looking forward to the Burt's Bee's Dark Spot Remover review. I love BB products. Very cute outfit:) Boyfriend jeans are so comfy. That bag is awesome looking! 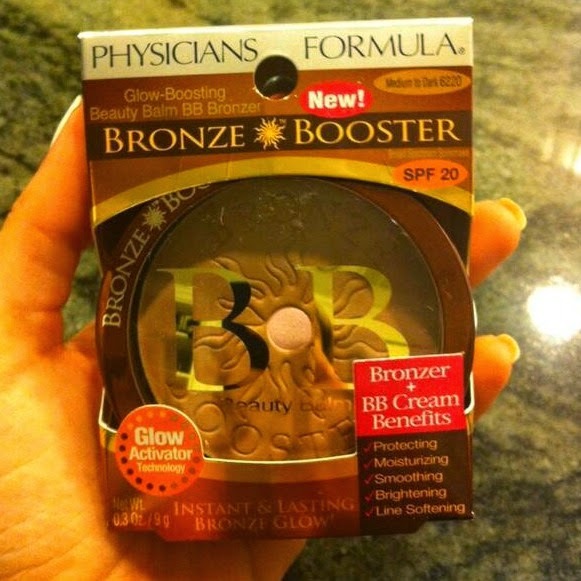 That Physician's Formula Bronzer looks awesome. your jeans are adorable and I totally want them!